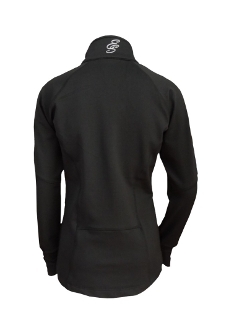 The ES Performance Sport Figure Skating Jacket will keep you warm but is lightweight and dries quickly. Designed for teams and clubs, it has thumb holes on the cuffs and an open back and chest area for embroideries and team logos. Reflective ES logo on the back of the collar. Zippered pockets. Made from a polyester/spandex mix with a 4-way stretch. Available Black only in Child S - Adult XL. This is a clearance jacket. Brand new, but style has been discontinued. All sales are final. No refunds or exchanges.